Actually they just walked around the block. 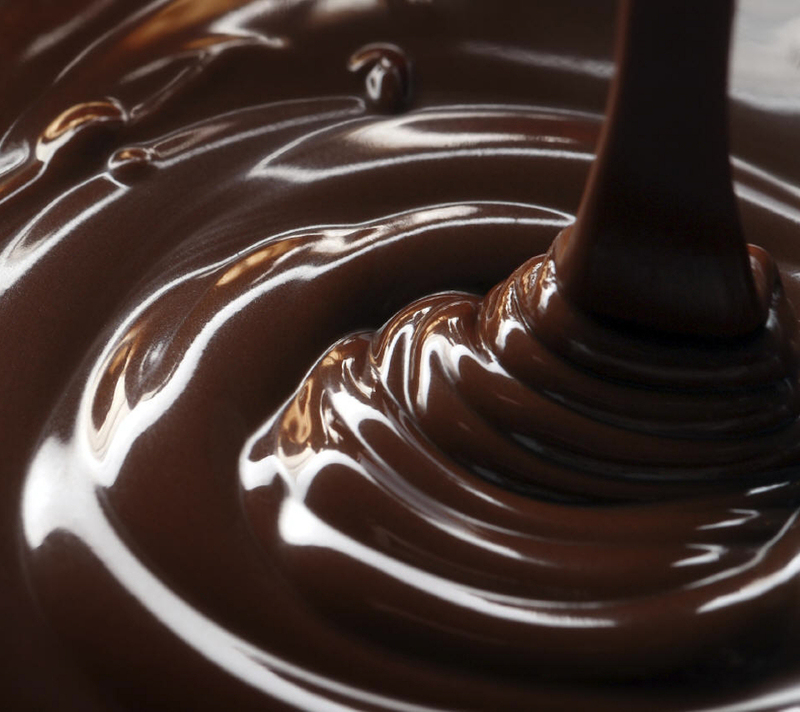 3 very tired children collapsed into bed while their parents raided the candy stash. This is Midget block 79. 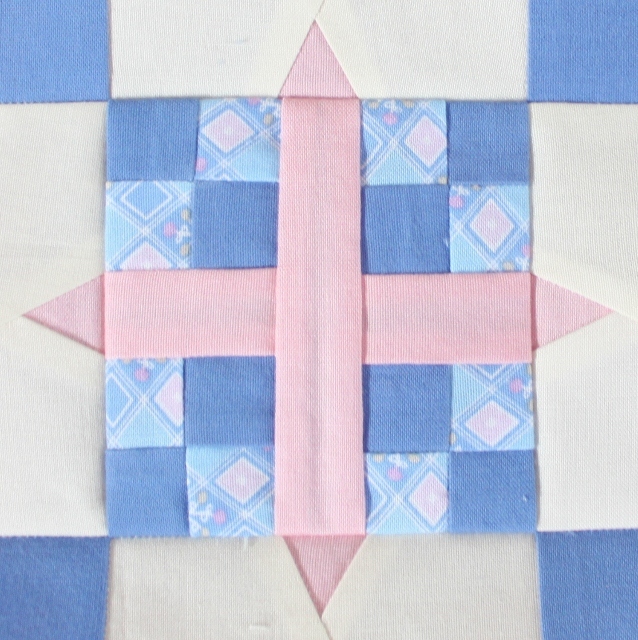 It is called Diamond Cross and was pieced with a combination of hand and machine piecing. 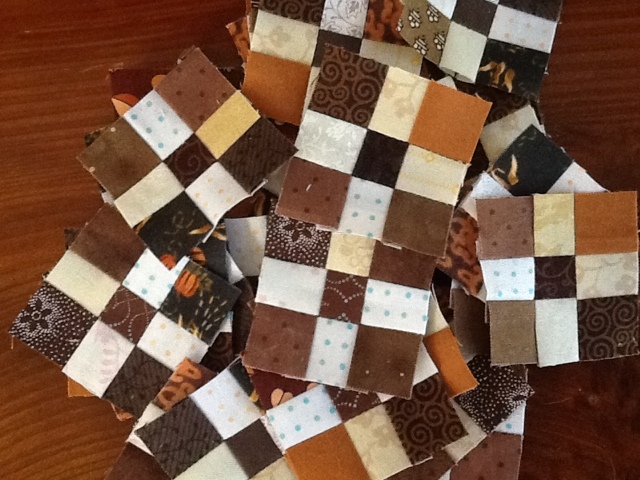 The four patches are made with 1 1/8 inch squares. How cute are they? Lizzie is my holder today as everyone else is out and about. She is such good company when the rest of the world gets crazy. 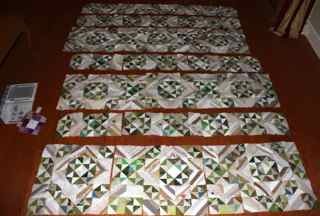 This is block number 93 and was paper pieced in four simple sections. Add in three traditionally cut pieces and it came together with no trouble at all. I switched the colors up a bit from the pattern, but the dark purple part seemed like a crown to me therefore wanted to be darker than the background. I am still getting lots of mileage out of the bundle of solids that I ordered. It is amazing how handy it is to have lots of colors to go with the patterns. Slowpoke Sunday - Binding Smith Mt. This poor quilt has been hanging out with half sewn binding for far too long. As soon as I finish getting the Jamestown Landing blocks together it is next on the list. Last time I was at Joann's with a special 30% off of everything coupon I picked up some Clover Wonder clips. They hold the binding in place just perfectly and are nicely curved so that it doesn't get flattened out under the clips. 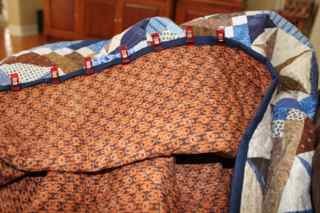 It has taken on a fall like feel around here and having an extra quilt to snuggle under would not be a bad idea. We've finally turned off the air conditioner and have the house opened up for fresh air. Hopefully everyone's allergies won't get too out of hand and make us seal it all up again. 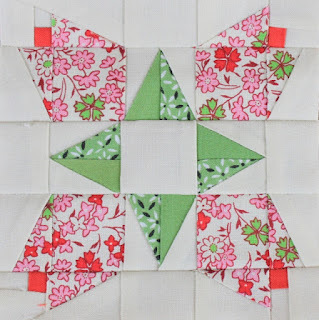 Head over to Kathy's Blog to see what other handwork is under way on this day of rest. I was pretty sure I had enough blocks done for Jamestown Landing. First I had to find Bonnie's new String Fling book to check the layout and count. Much cleaning and putting away of miscellaneous junk followed. Things are much better organized now, though not perfect by any stretch of the imagination. These blocks need to get sewn together sooner rather than later before a rabid dog or stray breeze decides to rearrange the layout for me. The border can wait for another day. 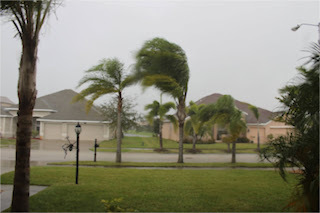 It was still a bit of a blustery day today. 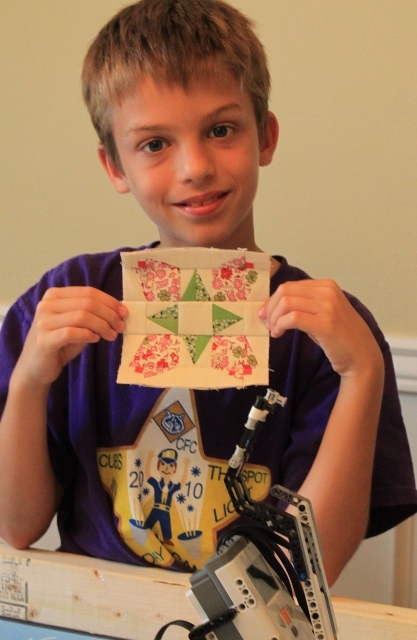 I would have loved to spend the day hanging around the house and sewing mindlessly. 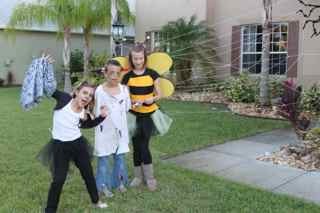 Though there was a some of that, there were also a couple of Halloween parties, a Lego practice and the usual weekend routine. Most of my mental and emotional energy was spent on my mom who had some complications after a medical procedure on Friday. I was ready to fly up to be with her, but I think things are more stable now and I'll wait for next weekend to go up and spend time with her when she is out of the hospital. 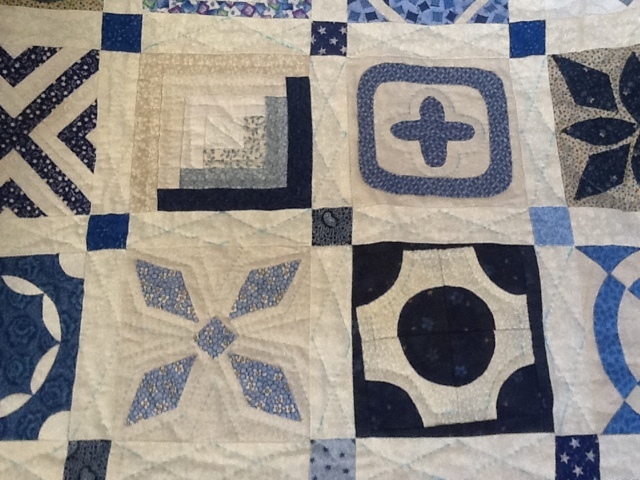 I have been trying to clear things out recently and dug out this unfinished quilt that keeps popping up from time to time. Anna designed it to go with her room but then got a fancy bed in a bag from Noanie instead. 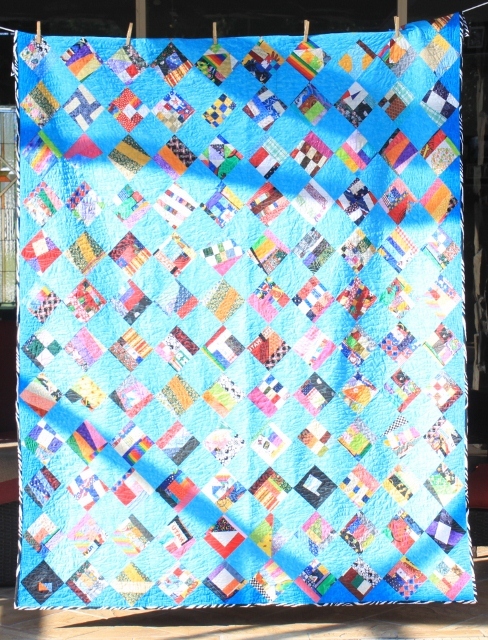 I didn't want to abandon the quilt, but didn't feel the need to complete the original queen sized design either. This seems to be about twin sized, and though it won't cover the entire bed, It will still be nice to have an extra layer to snuggle under. 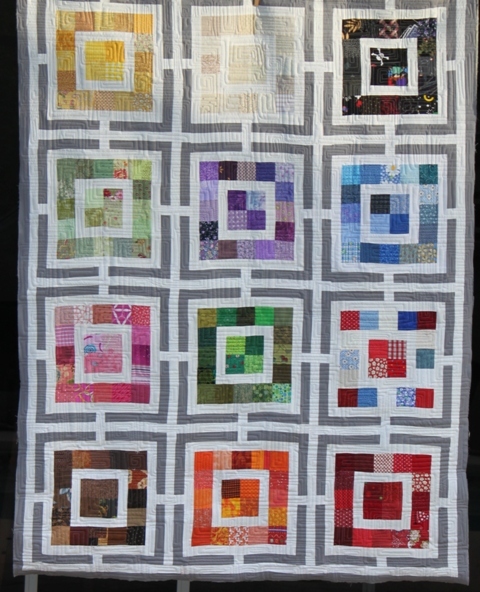 Instead of the 10.5 inch squares I've been into for quilt backs lately, I went with 12.5 inch squares this time. There is a wide variety of blue pulled from the scrap bin, the stash and the project box. One of the bits I pulled out was a panel with a world map on it. It is kind of fun to see random bits of continents popping out for no particular reason. Sydney still hasn't forgiven me for the boxers on the back of her crumb quilt, I wonder how Anna will feel about map bits? I devoted my "snow day" on Friday to finishing the string blocks for Jamestown Landing. I'll have to count to make sure they are all there, but I think I have enough now. Just a little more trimming and this one will be ready to go. October isn't quite done yet, but it is the last of the brown Saturday's today. I hope you've had time this month to put some your brown bits to good use. The mister linky below is available for all your brown related fun. It seems like a good day to stay inside. With school cancelled, staying in out of the rain sounds like a very good plan. We've been through enough real hurricanes to know the difference between this tiny little storm out to sea and the big ones headed straight for us that need to be taken seriously. 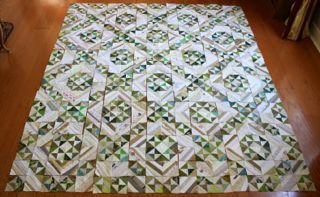 I have a stack of string blocks to work my way through, a quilt waiting for borders, gaggles of geese and a basket of midgets. Lots of choices and plenty of time. Can't beat that. 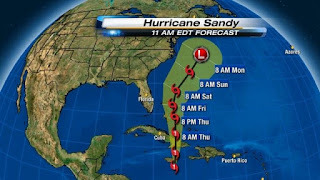 I was busy telling my AP Biology students that there was no way they would cancel school for tomorrow because Sandy was not going to come anywhere near us. I was quite adamant about it until I was interrupted by an e-mail announcing that school is cancelled for tomorrow. Y'all in the north can have your snow days, we are taking a hurricane day! 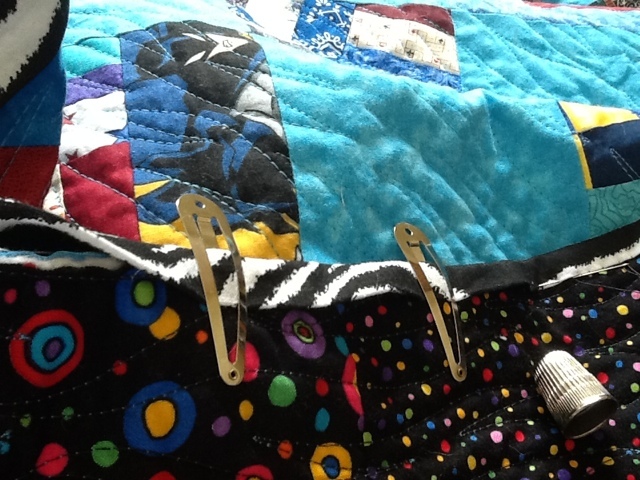 I wonder how much I can sew in a three day weekend of intermittent rain bands? I have a diet Mt. Dew, a closet full of fabric and plenty of motivation. WOOOHOOOO!!! So it was Tiny Tuesday yesterday and I had my block all ready to go. 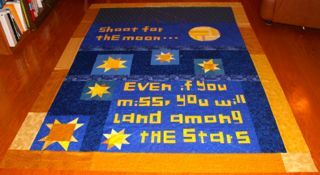 I love seeing what blocks everyone else is working on each week and seeing their quilts progress through the months and years. I have a list under the Midget Tab of all the of the people I know who are currently working on the same set of blocks. Did anyone else see on Jill's post that there are new blocks being posted?! 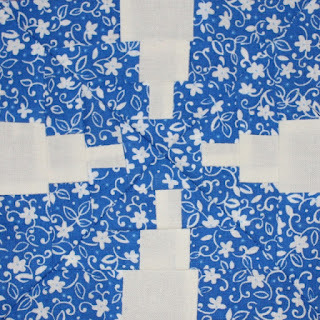 I had given up on seeing any new blocks before I was done with my quilt and had done the math to make it all work out. Now all of the sudden there are more blocks in the pipeline! 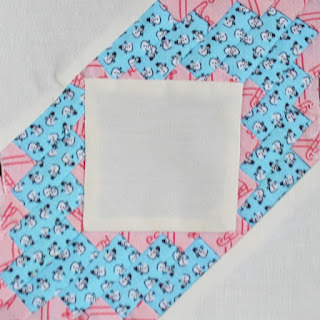 So if you are working on Midgets, or thinking about saving them for someday, head over to Sentimental Stitches and get the blocks before the older ones disappear. 1 through 50 have already been retired and need to be purchased, the next 50 will probably be retired soon, so go save them while you can. I think a new block will be coming out every week for a while. So far there are links to block 126 and 127. Midget Block 76 is called White House Steps. It is paper pieced in 12 sections. Don't tell anyone, but the outside is supposed to be red instead of blue. It came together quite simply. Some of the things that seemed hard when I started these blocks have gotten much easier in the last couple of years. 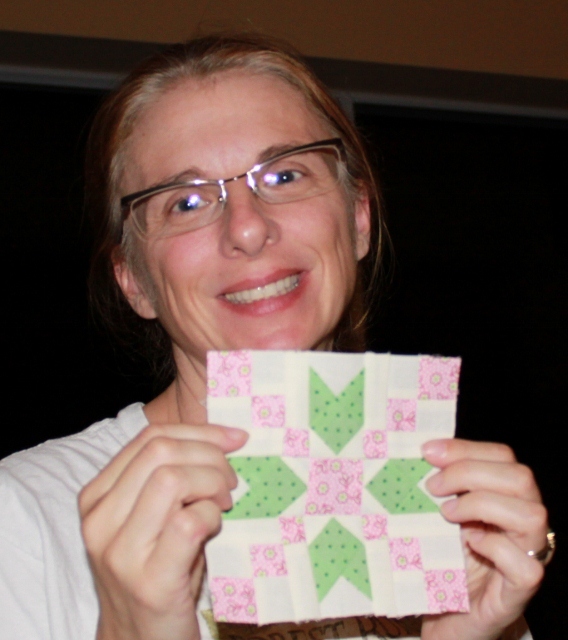 This simple little paper pieced block should not have taken any time at all to put together. For some reason I was convinced that the little light colored squares were supposed to be background color instead and had to sew each one twice. 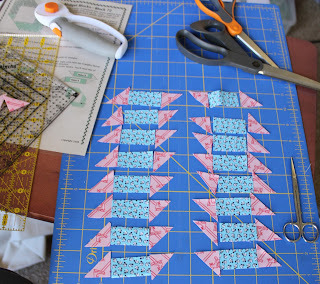 Reverse sewing on a paper pieced block is absolutely no fun at all. It is done now though, with the correct colors in all the right spots. 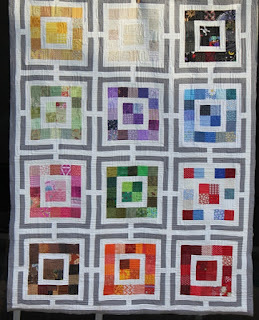 Getting this quilt done is starting to feel like a real possibility. 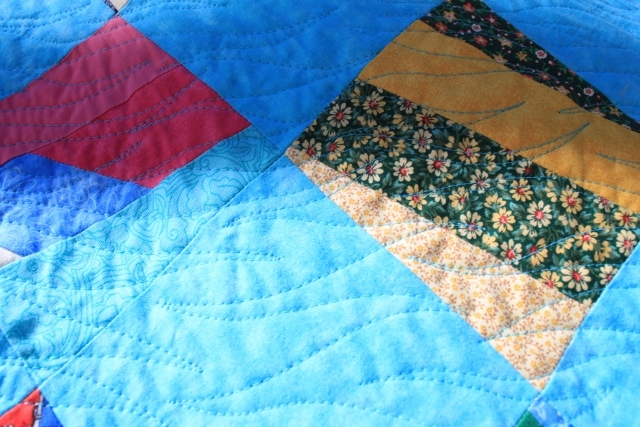 I got quite a bit of hand quilting done during my trip this week. 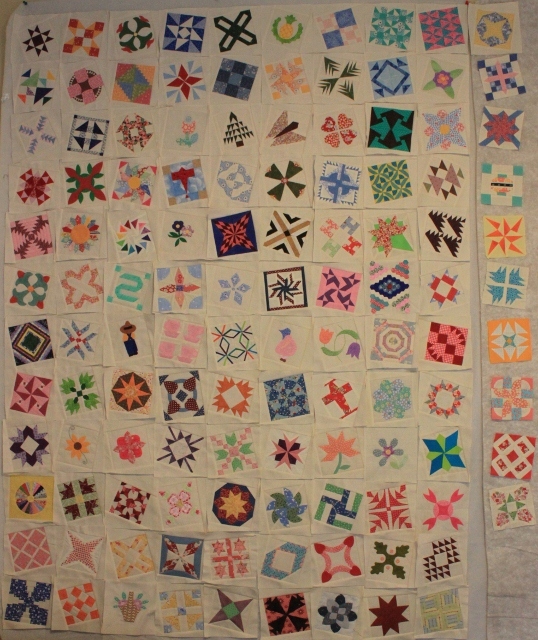 After going to the trouble to bring a quilt along, I was certainly going to work on it each evening for a while. This little corner is now complete. 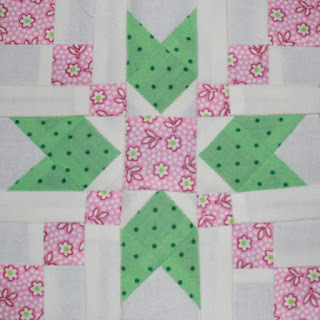 Maybe this afternoon I can work on a couple more blocks to finish off the row. I hope you are all finding a few minutes to slow down and take a breath on Sunday. I needed something simple and relaxing to sew as I decompress from my trip. These cuties fit the bill just perfectly. I have quite a nice little stash of one inch strips going and this project is putting them to good use. Ryan's team won their football game today which was VERY exciting. The girls enjoyed the Lego tournament too and are now scattered around playing with friends. I suppose I should unpack next. I always make fun of Kurt when he lets the suitcase age with dirty laundry for days. There are just two brown Saturdays left in the month. Some of you are so motivated that you are already making plans for the rest of the year. As for me, I'm still recovering from being out of town all week. 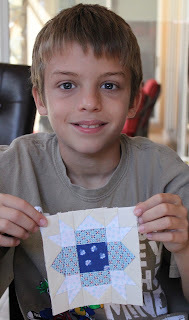 Obviously I have kid duty today, but there will probably be some time to sew when the morning driving is done. Kurt is taking the team to a Lego practice tournament this morning which has be taking Ryan to his football game. What brown scraps have you all managed to use up so far? Use the Linky below to share your progress. This one is called Dogwood. I'm really not sure why. It is Midget block number 73. 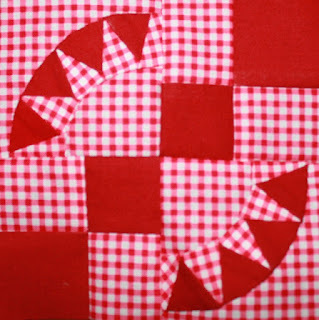 The wedge sections were paper pieced and then appliqued down. 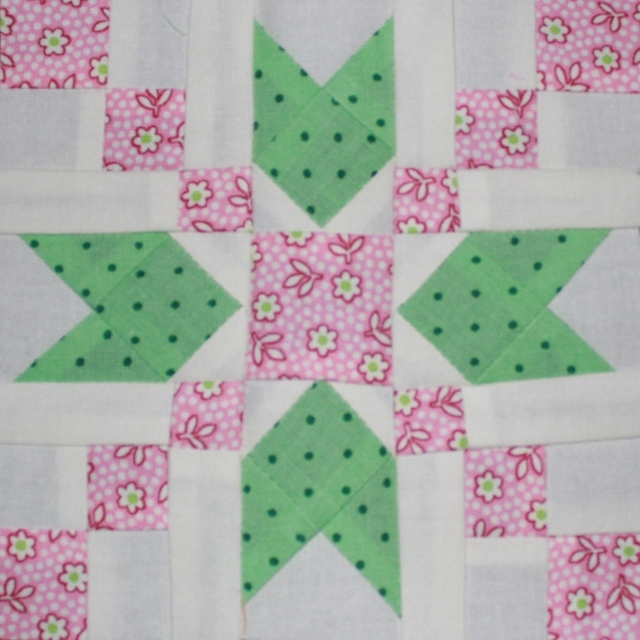 Those sections were paired with four patches, and viola, another Midget block is done. I am starting to get to the point of thinking about how many I should make. For now, I will just keep adding them to the wall one at a time. I have a nice little stack of handwork waiting patiently until I am done running around like a decapitated chicken. First though four days of lesson plans, packing planning, fretting over details that go with missing four days of school and going out of town. The girls wanted to go to Joann's today for tulle to make Halloween costumes. I didn't really need anything, but still managed to fill a couple of bags. I really do try to plan ahead when clearance fabrics are half off. Then lunch and shopping for some new work shoes and off to buy a new computer so that the kids and I will stop fighting over the laptop. I went Mac for the first time ever -- I'm so scared to switch platforms I haven't even opened the box yet. I think I'm all packed up -- even filled up the little travel shampoo. The one big decision that remains is what sewing to take along. I am very tempted to limit myself to handwork and avoid bringing the machine. Dear Jane would certainly keep me busy for the week and I have some baskets to applique that are portable. I had thought about taking geese for Hawaii Sunset or a stack of midgets, but I'm not sure I have the energy to get it all organized right now. 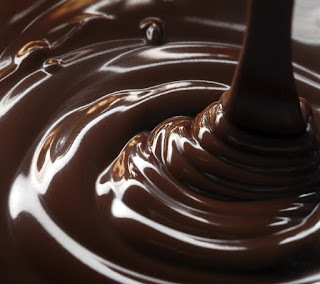 Are you all enjoying your chocolate creations so far? I am a bit behind this month, but have my browns sorted, ironed, and ready to go. Maybe today will be the day I actually sew something. How about you? I was at a workshop today when this message came to my inbox. 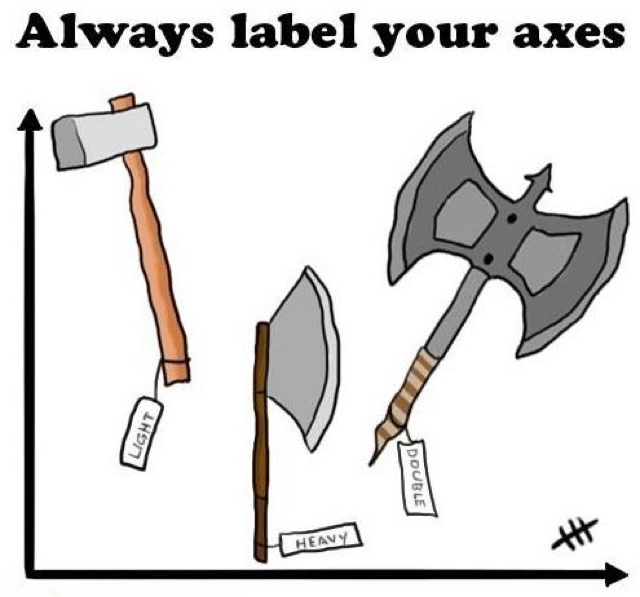 I am such a geek sometimes. Teal Crumbs has been having the binding slowly stitched all week. It needed to have a moment when I was home during the day to get some photos. Look at how bright it is in the afternoon sunlight. The quilting consists of some fire like fingers that run horizontally across the quilt. I u sed aqua thread on the front and black on the back. My thread stash has taken a big hit lately. I seem to keep using things up. Maybe I should do some shopping? I like the professional cones at Connecting Threads. First I'd better take a color inventory and match it against upcoming quilts. They do free shipping with a fifty dollar order. That might be too much thread. 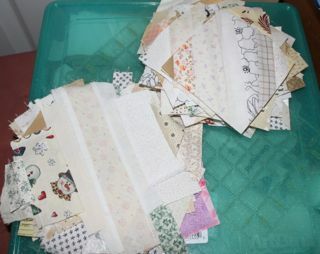 I'd better throw in a few rainbow bits for next years planned Rainbow Scrap Challenge Jane. 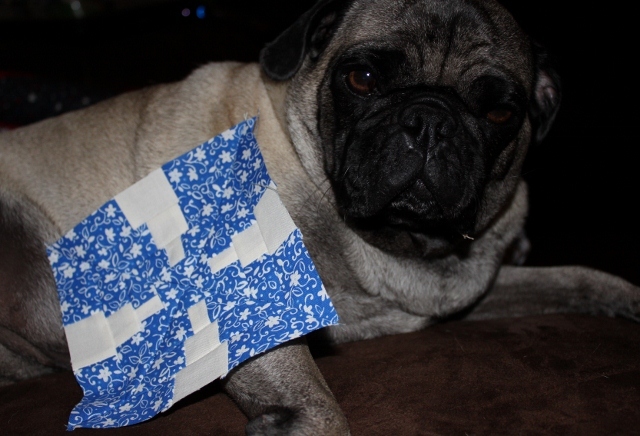 Sydney will never forgive me for including boxer fabric in the random black squares that make up the back. She was OK with everything else, but astonished that I put UNDERWEAR on her quilt. Tomorrow is a teacher workday and I am signed up for more AP training. So even though it is only Thursday, to me it feels like a Friday. I even tried to watch the VP debate last night and couldn't figure out why it wasn't on. I also went out to dinner with my friend Meisje who just started a new job. We've been trying to get together for ages, but we have both been busy lately. The big news of the week was an invitation in my inbox yesterday to attend a committee meeting for the new biology end of course exam in order to review item specifications. Attending a meeting didn't seem like too big of a deal until I read down further and realized that the meeting was 4 days long and out of town. 4 school days?! Yikes, that was a big deal. So much talking to administrators and negotiating for subs followed along with so much rearranging and planning of lessons. I'll get everything finished up this weekend and then start packing for my trip. 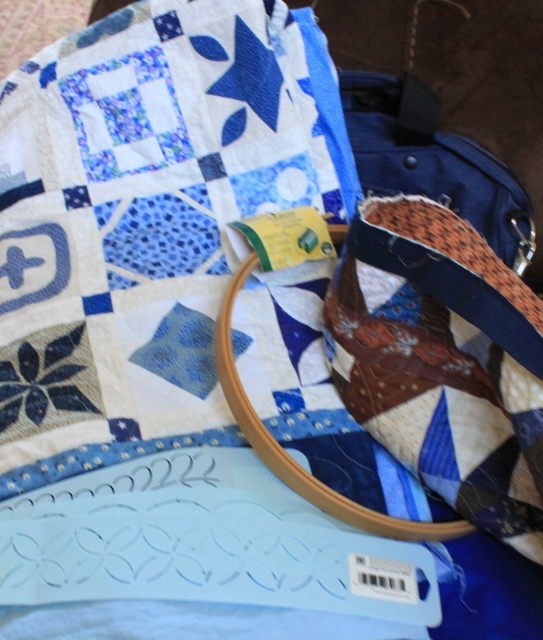 After talking to a coworker who has been to similar meetings in the past, I will also pack lots of quilting to work on in my hotel room in the evenings. I wasn't going to sew tonight, but when I popped in to see who had posted, I saw that Bonnie was online for quiltcam. It took just about one hour to get this little guy all cut out and sewn together. 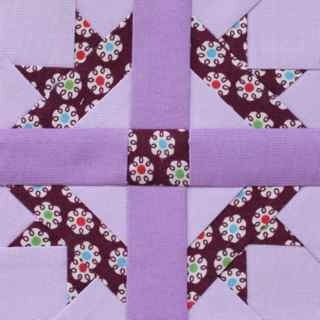 It is traditionally pieced and came together almost as the directions were listed. If you look at the small pink squares, you will notice that the ones closer to the center of the square are smaller. They were initially cut at 1 1/8 inches, but were supposed to join with rectangles that were cut to a 1 inch width. I trimmed the squares down and they fit just fine with the green arrow units. I think it is a really cute block. I like the pink and green together. This is definitely one that would make a nice quilt. 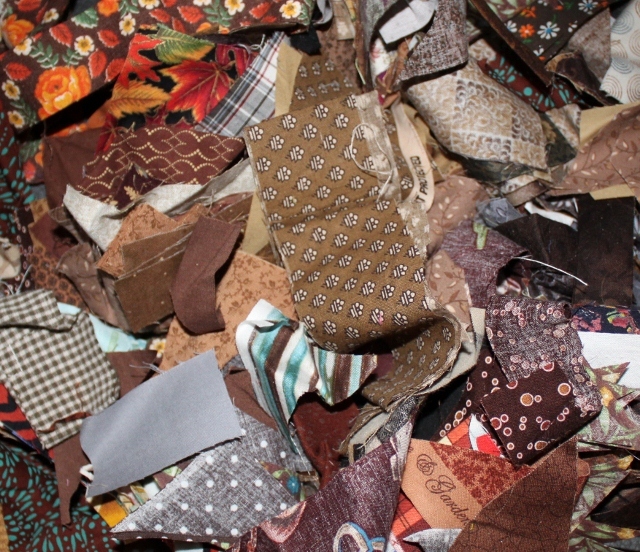 In fact, it reminds me of a Bonnie Hunter pattern -- maybe it was called Jared Takes a Wife? The arrows were put together differently, but I think it was the same block. 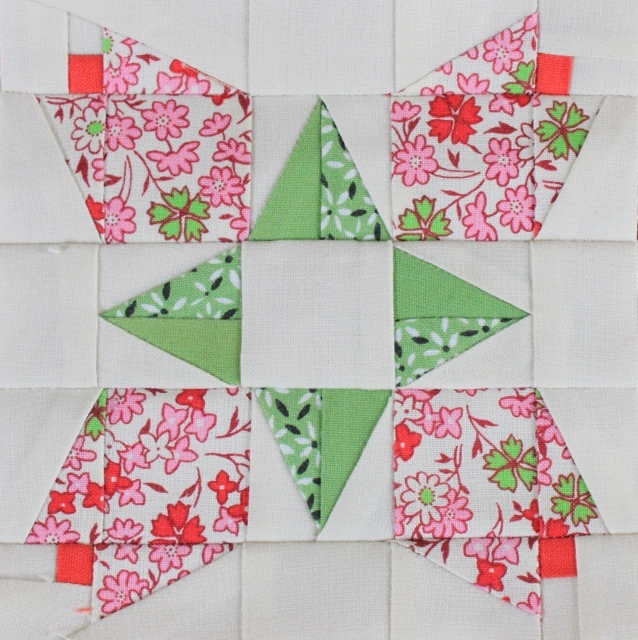 This is Midget Block #100, it is called Magnolia Bud and was paper pieced. 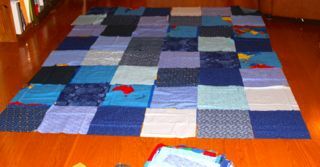 I think there were 10 sections, but they ended up going together in simple little rows. I really like the little red bits, and the two greens add a nice touch I think. Ryan was kind enough to take a break from his Lego programming for long enough to hold the block up for me. He thought it was "pretty cool", coming from him that is high praise indeed. After finishing this one, I realized that I missed some of the blocks in the 90s, so I will have to go back and add those in. I'll have to print out some more patterns first though, I seem to have worked my way through everything that was ready to go. Speaking of using things up, I am out of Tiny Tuesdays this year and starting to work on Mini Mondays instead. The posts will seem out of order, but it all makes sense to me. Just 22 more blocks to go! I didn't accomplish much on Hawaii Sunset this weekend because I was frantically sewing away at my Midgets. The 10 blocks along the right hand side are all new this week! In fact, there were so many that they didn't fit on the design wall anymore, so I went out and got a brand new flannel backed table cloth to add on to the existing wall. 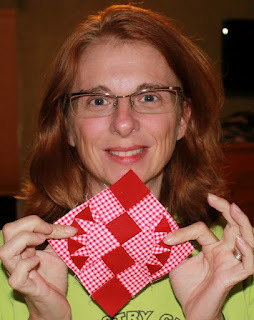 I need to make 22 more blocks to get to the 144 block target that I have in mind. 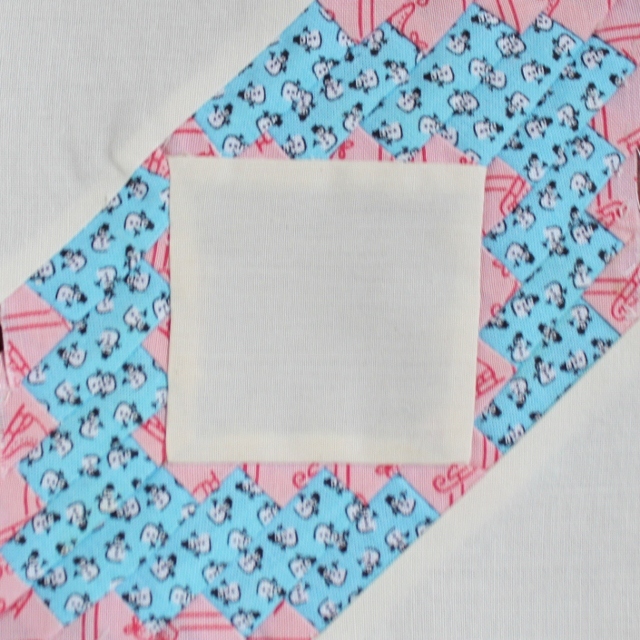 There are 25 page protectors all lined up with fabric and patterns just waiting to be sewn. I think my goal of finishing before Christmas is starting to seem very realistic. Head over to Judy's Blog to see what other people have accomplished this weekend. I've been on a maniacal midget marathon. Posting one block each Tuesday, I've just written the post for Christmas Day! Having run out of printed patterns though, I was forced to take a break. Ryan is using the computer for Lego programming, leaving me at a transition point. Sydney is firing up the DVD player with The Avengers so I will sit and stitch some binding. 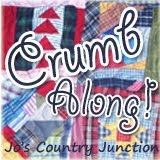 The Teal Crumb quilt is almost done and Smith Mountain is next in line. 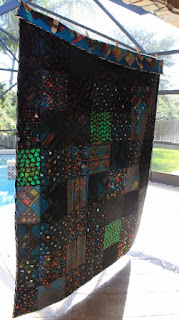 I wanted to take a minute to share my favorite two quilts from last year. 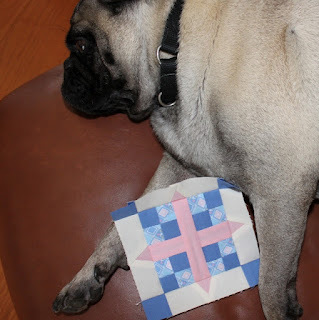 Notice the gravitas that the black and brown add to the quilt. Without something darker for grounding it would be easy for the rainbow colors to float away. 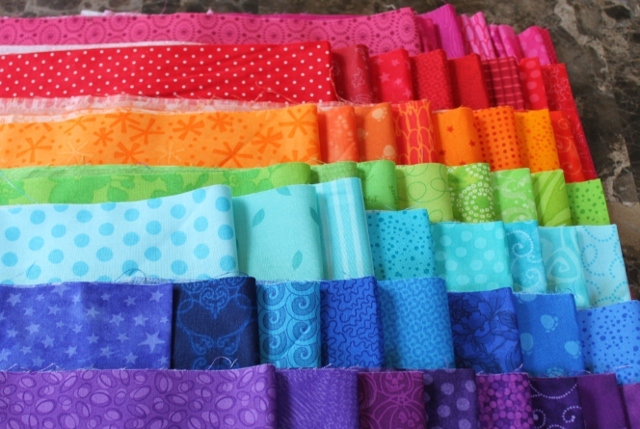 As the year starts to wind down, the color options for the Rainbow Scrap Challenge are becoming narrower. 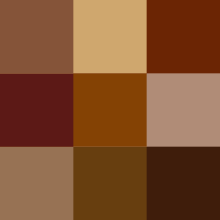 Many already guessed that this month would be brown. Some of you would rather not include the darker colors in your rainbow of blocks. That is fine of course, it is your quilt after all. 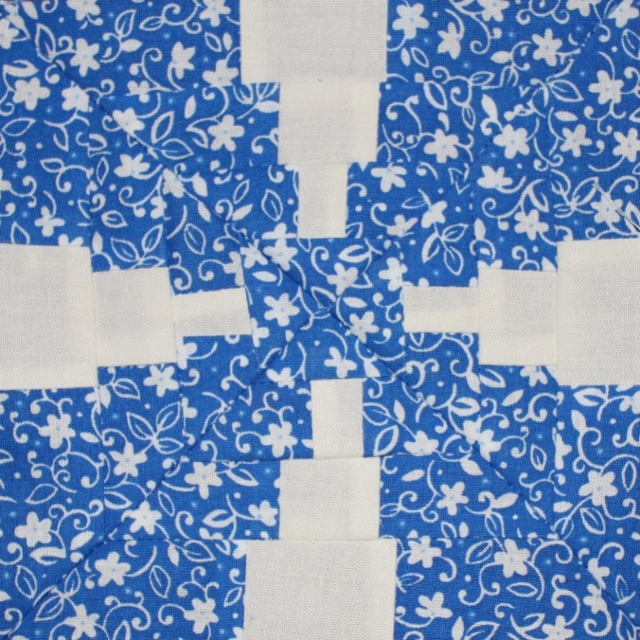 Before you leave it out entirely though, think about what a few darker anchor blocks will do to ground your quilt. Give it some thought, try it out. If you still don't like it you can always turn the extra blocks into potholders, fall place-mats or even hide them on the back of the quilt. Why not sew a few scraps together and see how you like them? They were already scraps after all, you aren't wasting a thing. 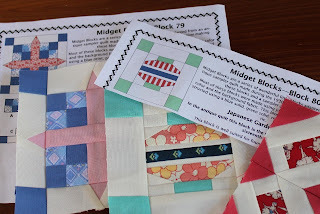 I was home sick today and didn't have a lot of energy, but I did work on a few midget blocks. Here is a sneak peak, but the full posts will wait for Tiny Tuesdays. I have another applique block prepped to work on during the presidential debate tonight. I might have to watch it in a different room from my husband who gets very emotional about these things. The exciting news for today is that I go brand new and fabulous fabric in the mail. I am planning to start a Rainbow Dear Jane as soon as the Midgets are all done. (Don't know when that will be -- but maybe by the end of this year?) When I saw these beautiful bundles at the Twiddletails store, I knew they would be just right. The only one I didn't put in my cart was a yellow set that seemed to have a lot of white background going on. Aren't they purdy? 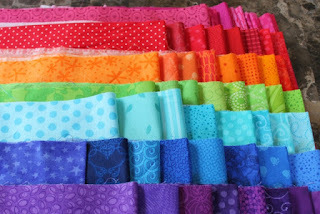 Of course now I have the urge to go and make a few blocks just to try out all this new fabric, but I will resist. Some blocks just make you stare, scratch your head and wonder. I'd been looking at this one for quite a while before its number came up wondering just one thing -- WHY? In the end, I tackled it just like so many other things. 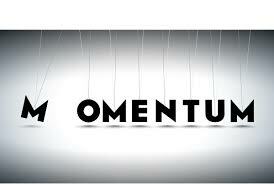 Take a deep breath and start with step one. So I cut 16 blue rectangles at 7/8 x 1 3/4 inches. Seriously? 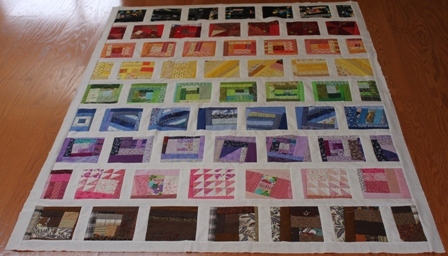 Even better, the next step was 32 triangles from 1 5/8 inch squares cut into fourths. OK. Next, line up all the little bits and sew them together. It wasn't so bad in the end, though I will admit to sewing one corner on the wrong way before figuring it out. I won't call it perfect, but I will say I am glad to cross it off the list.